The City and Translink are reviewing downtown bus service. This is a great opportunity for residents and visitors to weigh-in on the sorts of improvements that they’d like to see to the bus network. 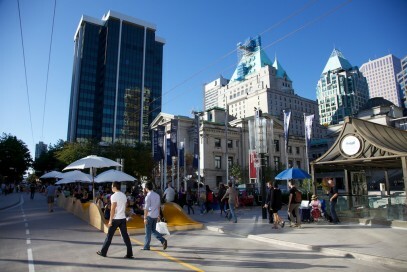 Moreover, it is a significant opportunity to support key public space improvements in the process – including the expansion of Robson Square and the pedestrianization of the 800-block of Robson Street. Please take a moment to share your thoughts on this important issue! There will be Open Houses held in Downtown Vancouver on Saturday, June 22, and Wednesday, June 26 (see below for open house details). You are also invited to take the Downtown Local Bus Review online questionnaire, which will be accepting responses from June 21st until July 12th. Since the beginning of 2013, the City of Vancouver and TransLink have been jointly undertaking a review of local bus service in Downtown Vancouver. The objective of the review is to consider changes to local bus service, as the current bus configuration has not accounted for a number of new realities, such as the growth in the population living downtown, the existence of the Canada Line, the desire for public space improvements (such as a pedestrianized Robson Square), and other potential changes (such as the removal of the Georgia and Dunsmuir Viaducts and a proposed move of the Art Gallery). This Local Bus Service Review aims to support the bus-related needs of current and future residents living in downtown. This should be welcome news for residents and visitors to the area. There is significant room for improving transit on the peninsula — perhaps most significantly in the West End, where the neighbourhood houses a larger number of seniors (5,500 – or about 12.5% of the total neighbourhood population). Traffic congestion caused by visiting car traffic could also be mitigated considerably, if fast, convenient and reliable bus-service were available. The current transit plan for the downtown was done at a time when much of the new development in the area had not yet taken place. It’s time to refresh the bus routes and service planning so that transit can work well for everyone. This means taking a look at trolley and non-trolley bus routes, community shuttles and other transit linkages. We welcome this review process. Our hope is that it will lead to a stronger, more efficient bus service in the area – one that is easy to understand, improves transit-related mobility and access (by effectively linking bus riders to key local and regional services – from shopping streets to medical facilities, cultural facilities to SkyTrain stations) and links all the downtown neighbourhoods – West End, Coal Harbour, Gastown, Yaletown and the Central Business District. Of course, as a public space advocacy organization, we want this bus routing to support a stronger, richer downtown public realm – one that includes a pedestrianized Robson Square, improvements to the north plaza, Granville Street, and key public spaces throughout the peninsula. 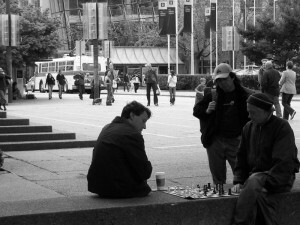 A classic photo of Robson Square by benleto. The City of Vancouver and TransLink will be consulting the public for feedback on the Downtown local bus review at two upcoming Open House events. We encourage everyone to attend, learn more about the review and let them know your thoughts. TransLink and the City of Vancouver are taking feedback through an online questionnaire, which will be taking responses from June 21st to July 12th. The review is scheduled to conclude at the end of 2013. For the music-lovers out there, don’t forget that this Saturday and Sunday (June 22-23) finds an array of free jazz taking place at the outdoor Robson stage (on the 800-block). It’s all part of the larger Vancouver International Jazz Festival. You can find the Robson stage listings on the main Jazz Fest website. For more background on the VPSN’s work with Robson Square, see the VPSN blog achives. Please feel free to send your thoughts our way: robsonsquare [at] vancouverpublicspace [dot] ca. Monthly Meetup: An Update on Transportation 2040 – What’s Happened & What’s Next?